The Williams FW36 debuted on 28 January at Circuito de Jerez, Spain. It did however only complete a small number of laps, as the team, like many others, struggled with electrical issues on its new car. 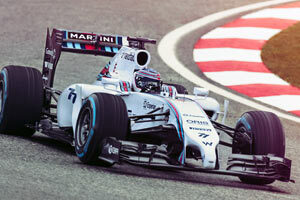 According to Williams, the FW36 is one of the most technologically advanced Formula One cars ever product by the team. It's the result of two years of development and research by the team's technical departments in Grove. Heading the Williams engineering department is Pat Symonds, and although he came in too late to have a really big impact on the basis of the Williams design, the signs from within the team were positive and new hires were announced to help the team progress. Such had not been possible with Mike Coughlan, the team's previous technical director as he had been a much talked about figure in the sport following his involvement in McLaren's spygate. The design phase of the FW36 was completed by mid-September, by which time the team had found solutions to the major challenges presented by the regulations. Cooling, weight, a new gearbox and aerodynamic changes are just some of the areas of focus. The new eight speed gearbox is still a Williams design but was tested on the Mercedes dyno in Brixworth from the beginning of November 2013, before running with the full power unit several weeks later. As of the launch, the car featured a very neat and clean design, having a fairly tiny nosecone with an elephant's nose, allowing as much air as possible to go underneath while still be within the regulations of the limited nose height. Contrary to many other cars seen at Jerez, the sidepods still featured a sizeable undercut to help diffuser performance. Uniquely, the FW36 also had a wing mounted very low above the car's floor, attempting to replicate the effect that the banned beam wings used to have. In further pre-season testing at Bahrain, the team ran its FW36 competitively and very reliably with just a single on-track stoppage on the final day of testing due to high mileage on the car's engine. The team revealed it had hit all its reliablity targets, contrary to most others who were still fixing issues ahead of the first race.